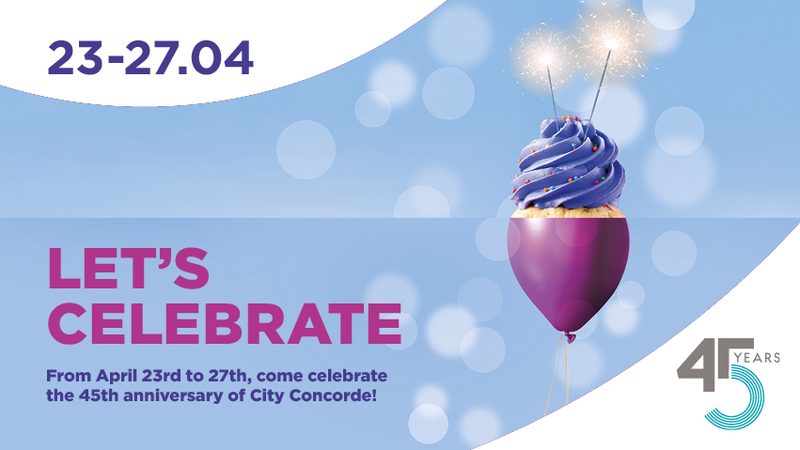 From April 23 to 27, come celebrate the City Concorde’s 45th birthday! Indoor train, labyrinth, virtual reality, walking piano, tastings, birthday cake, crémant and big contest … Many surprises await you during those five days. From Tuesday to Saturday, you can have some fun in our indoor labyrinth in the atrium or drive around the center in our very own indoor train. From Wednesday on, entertainment will be provided thanks to our XXL games, our exclusive walking piano, an interactive speed game or even participate in one of our cupcake workshops on Wednesday and Thursday, from 1 p.m. to 6 p.m. Starting Thursday, a balloon sculptor will make objects and figures magically appear, the little ones can get some funny facepainting, a bubble artist will welcome you outdoor in front of the new entry, a virtual reality stand will make you discover new worlds without even leaving the City Concorde and a DJ will assure musical entertainment during the whole weekend. Of course, a birthday calls for cake and crémant! On Friday and Saturday, from 3 p.m. to 7 p.m., come grab your slice of cake from our partners Fischer, Cocottes, Pâtisserie Ose and Oberweis and glass of Gales crémant. And for those who want to party further, take part in our contest and you might just be the winner of a Party-Bus ride for 45 persons, DJ and drinks included. All you have to do is fill one of the forms available in every shop in the center from Tuesday April 23rd on and drop it in one of the ballot boxes. Those celbrating their birthday between April 23rd and 27th, come say hi at our reception: a small birthday present will be handed to you from April 23rd on. Happy Birthday!